Quote; "Few people know that the number of financial penalties (‘sanctions’) imposed on benefit claimants by the Department of Work and Pensions now exceeds the number of fines imposed by the courts. In Great Britain in 2013, there were 1,046,398 sanctions on Jobseeker’s Allowance claimants, 32,128 on Employment and Support Allowance claimants, and approximately 44,000 on lone parent recipients of Income Support. By contrast, Magistrates’ and Sheriff courts imposed a total of only 849,000 fines. 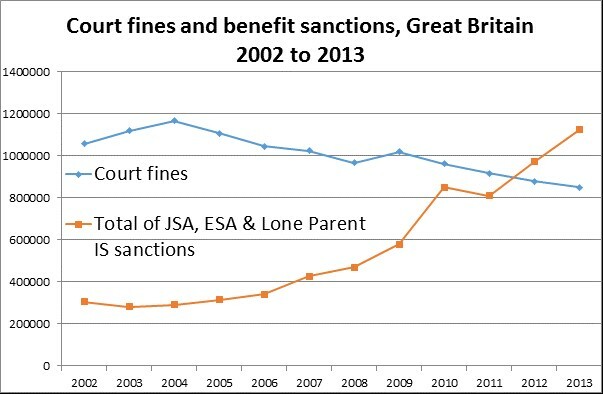 Sanctioned benefit claimants are treated much worse than those fined in the courts. The scale of penalties is more severe (£286.80 - £11,185.20 compared to £200 - £10,000). Most sanctions are applied to poor people and involve total loss of benefit income. Although there is a system of discretionary ‘hardship payments’, claimants are often reduced to hunger and destitution by the ban on application for the first two weeks and by lack of information about the payments and the complexity of the application process. The hardship payment system itself is designed to clean people out of resources; all savings or other sources of assistance must be used up before help is given. 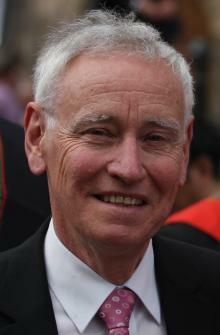 David Webster’s written and oral evidence to the House of Commons Work and Pensions Committee inquiry into Benefit Sanctions beyond the Oakley Review is available on the Parliament.uk website and and his other papers on sanctions are available via Child Poverty Action Group.